From January 5th-10th we made a trip across a good bit of the country so we could take our daughter to El Paso for grad school (UTEP). 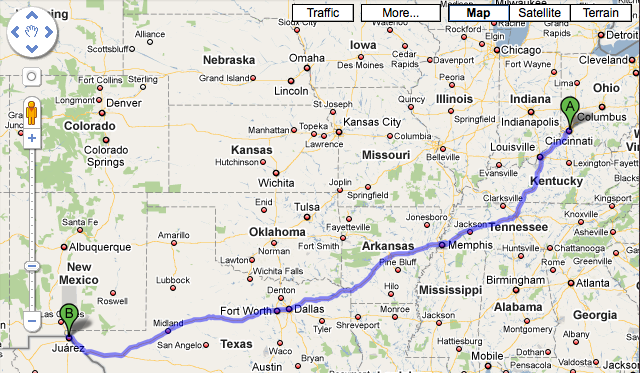 EP is about 1,500 miles from Cincinnati, just about half of which is in Texas. Dang, Texas is big. The Google Maps image shows the route we took. Two days to get there, two days to recover, and two days to get back. 1. Wind farms near Sweetwater, TX. I wrote about this in a separate post, which I filed from my Blackberry on the road after taking a photo from the moving van. 2. Almost all the Arkansas towns you’ve ever heard of are on the same stretch of road. That would be Interstate 30. There’s Little Rock, Benton, Hope, Hot Springs, and of course Texarkana. 3. Best meal: gorditas from The Little Diner in El Paso (actually in Canutillo, just northwest of the city). An undistinguished building in an undistinguished block, but it’s been written up in Gourmet magazine and others. And well worth a detour. Runner-up: cowboy-cut pork ends at 11 pm from Randy’s Smokehouse in New Boston, TX. 4. Radio stations: Ugh. I plan to do a separate post about this. Not much of interest anywhere, unless you like smarmy preachers and country music. Because of my professional background in radio, I was looking for public stations. I heard Morning Edition in a few places, and Diane Rehm (mercifully), but very little classical. The iPod got a workout. However . . .
6. Worst roads, overall: I-30 from Texarkana to Dallas. Fast traffic, very short entrance and exit ramps, with strip malls and tiny little businesses right up to the roadway. Southwest from Dallas the road is better, but not the ramps. None of the roads we saw had fences running alongside. Judging from tire tracks, people don’t use ramps to get on and off the highway anyway – they just drive across the berms, it seems. Runner-up: short stretch of I-40 in Arkansas just across the Mississippi from Memphis. However, most of I-40 runs past extensive wetlands, which is pretty cool. Lots of waterfowl everywhere. I-40 east of Memphis is pleasant, also. 7. Most directionally-challenged employee encountered: the otherwise very friendly young lady who tried to direct us to the Days Inn in Texarkana. Bless her heart, she didn’t know the number of the exit where it was located, and she couldn’t say for sure whether they were north or south of I-30. The highway travel circular where we found their $49 coupon also got it wrong, compounding our confusion.